The Good Practice Guide Complying with the GDPR and DPA 2018 contains appendices including a range of privacy notices, information for children and a job description for a Data Protection Officer. These can be purchased as electronic Word documents for unlimited future use. Please note that you only need to buy ONE set for use across the agency. Eighteen leading figures in the field of adoption and fostering contribute to this special edition of BAAF’s acclaimed journal. They reflect on what has been achieved in family placement in the last three decades and also consider some of the many challenges that remain. Themes discussed include: contact; the evolution of developmental psychology; the importance of recognising children’s family and social relationships through to adulthood; assessment; and listening to children. 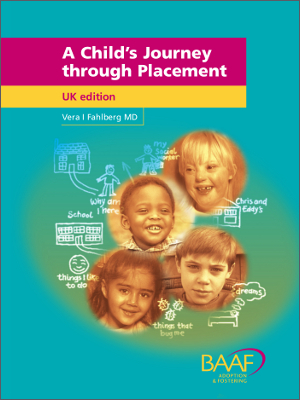 Separation, loss, grief and change are expected parts of the experience of children in placement. How do those charged with the responsibility of planning for these children address their needs? 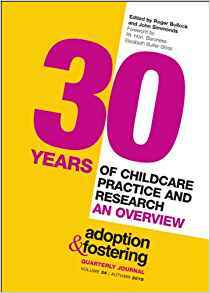 This essential reference book - a 'must-read' text for more than 20 years - contains the theoretical knowledge base and skills necessary for understanding, working with and planning for children and their families. 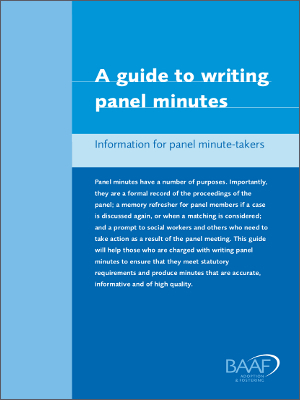 This pamphlet helps panel minute-takers to meet statutory requirements and produce accurate and high quality minutes. Single carers are a valuable resource for waiting looked after children, but more could be done to increase the numbers coming forward, to improve the way in which they are assessed, and ensure that they get the support they need. 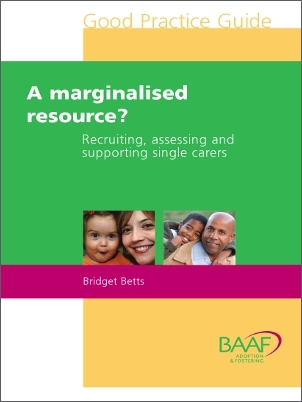 This practice guide reviews the research, relevant legislation, and policy and practice issues surrounding the recruitment, assessment and support of single carers, and provides authoritative practice advice for those involved. Rufus the cat loved curling up in his favourite place and dreaming of pilchards. 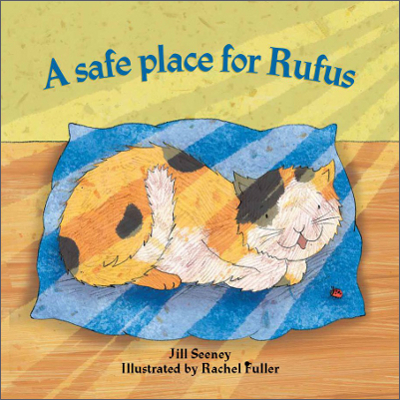 But it hadn’t always been like this… When Rufus was a kitten, he lived with a different family who weren’t always kind. Would he ever find a safe place where he could be cosy and calm and dream his dreams? 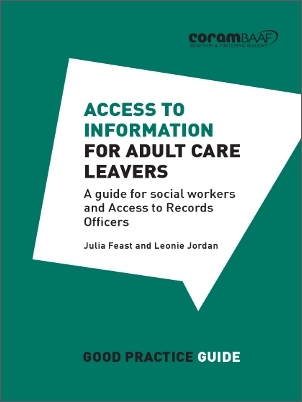 This Good Practice Guide aims to set out a protocol for dealing with Subject Access Requests (SARs) in order to improve services for adult care leavers and establish greater consistency and quality practice across organisations. 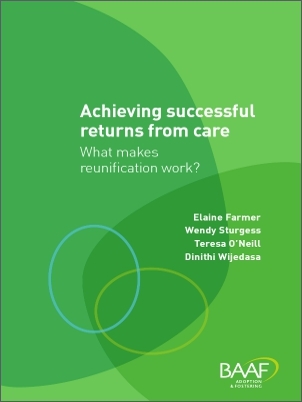 Reunification has been little studied in the UK but given its place in care planning for looked after children, it certainly deserves greater attention. This study, looking at 180 children, follows the patterns and outcomes of return home; which factors are associated with successful and unsuccessful returns; and the families' views on returns. The results of the study provide important conclusions for policy and practice. If you really want to learn about children's wishes and feelings about adoption and their experience of it, this book is for you. 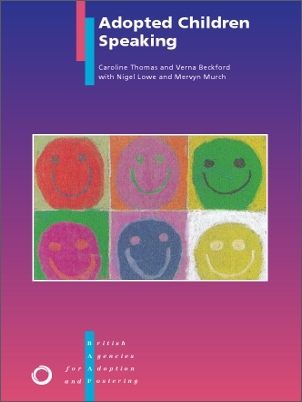 Bringing together views collected as part of a wider research project, this book gives voice to the perspective of children themselves on their adoption. 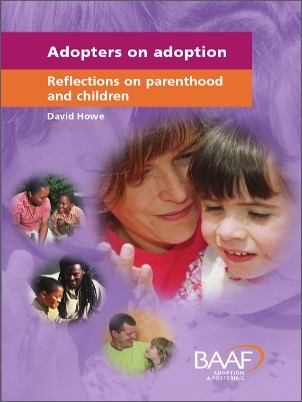 Full of moving and poignant testimonies, it provides revealing insights into what children and young people themselves think and understand about adoption. How does it feel to care for someone else's child? How do adopters feel about birth parents? What is the balance of influence between children's inherited characteristics and the way they are raised? This absorbing collection of personal stories gives voice to adopters' experiences, thoughts and observations about adoption. Still can't find what you want? Send us an email via the link beneath and we'll get back to you as soon as possible. Did you know that as an individual member, you can select three new or recently published CoramBAAF titles each year from our annual publications programme? Find out more about the benefits of individual membership and how you can become part of the leading membership association for adoption and fostering agencies and professionals.